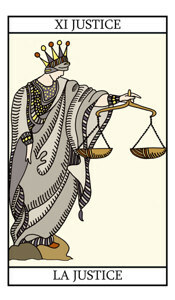 The justice card is symbolic of the resolution of conflicts. If there are issues in your life at the moment that may need attention then it is possible that you will have some hard unwelcome choices to make possibly contractual or legal in nature. However hard these choices are though, it is most certainly with a positive end in mind. The card is often symbolic of partnership or marriage issues particularly in a legal sense. Depending upon other cards, marriage is sometimes foretold and also legalities relating to marriage. If you have a partner, honesty is most certainly the best policy here. It is important to take a firm and balanced view in everything that you do as you will reap what you sow, but don't worry because good counsel will be at hand. AAs this card follows the traditional symbolism and carries above all its obvious meanings, there is little to say regarding it outside the few considerations collected in the first part, to which the reader is referred. It will be seen, however, that the figure is seated between pillars, like the High Priestess, and on this account it seems desirable to indicate that the moral principle which deals unto every man according to his works--while, of course, it is in strict analogy with higher things;--differs in its essence from the spiritual justice which is involved in the idea of election. The latter belongs to a mysterious order of Providence, in virtue of which it is possible for certain men to conceive the idea of dedication to the highest things. The operation of this is like the breathing of the Spirit where it wills, and we have no canon of criticism or ground of explanation concerning it. It is analogous to the possession of the fairy gifts and the high gifts and the gracious gifts of the poet: we have them or have not, and their presence is as much a mystery as their absence. The law of Justice is not however involved by either alternative. In conclusion, the pillars of Justice open into one world and the pillars of the High Priestess into another.